Marbled papers were the first decorated endpapers. 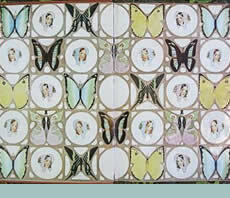 Originally, endpapers were made only of white paper or vellum. Marbling may be defined as the floating of colors on a liquid to form a pattern and then capturing that pattern by placing a sheet of paper on the floating colors and lifting it. This mostly secret method of decorating paper originated in the Far and Near East. The first Europeans to encounter the craft of marbling were travelers to Turkey and Persia in the later 16th century. Intrigued by this “cloud art” or “ebru,” they sent home samples and descriptions of how the paper was made. It took only about 25 years, until around 1600, for marbling to filter into Europe by way of Mediterranean trade routes. It was practiced initially in Germany and in France, which was the first European country to use marbling for books. Marblers have always guarded their knowledge carefully and maintained it as a trade secret. In the guilds, which were the main centers of education and industry, each apprentice was trained in a separate part of the work and was taught to make only one or two of the patterns so that he wouldn’t have enough expertise to set up a rival establishment. Throughout the 18th and early 19th centuries, marbled papers were the endpapers of choice for finer bindings. Following the lead of France and Germany, other European countries began marbling papers around the mid 18th century. England and America took up the craft towards the end of the century. By the first quarter of the 19th century, the English, along with the Germans and French, were acknowledged as the Western world’s greatest marblers. Towards the end of the 19th century, marbled papers of all kinds were used in fine bindings. More and more were machine-made and less and less were the authentic product. This machine-made marbling was used in highly polished calf bindings and in sets with half morocco bindings. The papers were often marbled with gold veins. By the 1930s, only a handful of professional marblers were active in the entire Western world. Today, in a small way, the craft of marbling has revived. Artisans still produce beautiful patterns and still guard their trade secrets.